Engineers harnessing the same physical property that drives silent household air purifiers have created a miniaturized device that is now ready for testing as a silent, ultra-thin, low-power and low maintenance cooling system for laptop computers and other electronic devices. The compact, solid-state fan, developed with support from NSF's Small Business Innovation Research program, is the most powerful and energy efficient fan of its size. It produces three times the flow rate of a typical small mechanical fan and is one-fourth the size. Dan Schlitz and Vishal Singhal of Thorrn Micro Technologies, Inc., of Marietta, Ga. will present their RSD5 solid-state fan at the 24th Annual Semiconductor Thermal Measurement, Modeling and Management Symposium (Semi-Therm) in San Jose, Calif., on March 17, 2008. The device is the culmination of six years of research that began while the researchers were NSF-supported graduate students at Purdue University. "The RSD5 is one of the most significant advancements in electronics cooling since heat pipes. It could change the cooling paradigm for mobile electronics," said Singhal. The RSD5 incorporates a series of live wires that generate a micro-scale plasma (an ion-rich gas that has free electrons that conduct electricity). The wires lie within un-charged conducting plates that are contoured into half-cylindrical shape to partially envelop the wires. Within the intense electric field that results, ions push neutral air molecules from the wire to the plate, generating a wind. The phenomenon is called corona wind. "The technology is a breakthrough in the design and development of semiconductors as it brings an elegant and cost effective solution to the heating problems that have plagued the industry," said Juan Figueroa, the NSF SBIR program officer who oversaw the research. With the breakthrough of the contoured surface, the researchers were able to control the micro-scale discharge to produce maximum airflow without risk of sparks or electrical arcing. As a result, the new device yields a breeze as swift as 2.4 meters per second, as compared to airflows of 0.7 to 1.7 meters per second from larger, mechanical fans. 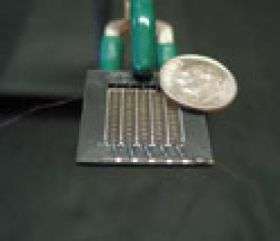 The contoured platform is a part of the device heat sink, a trick that enabled Schlitz and Singhal to both eliminate some of the device's bulk and increase the effectiveness of the airflow. "The technology has the power to cool a 25-watt chip with a device smaller than 1 cubic-cm and can someday be integrated into silicon to make self-cooling chips," said Schlitz. This device is also more dust-tolerant than predecessors. While dust attraction is ideal for living-room-scale fans that that provide both air flow and filtration, debris can be a devastating obstacle when the goal is to cool an electrical component. Why a DC power supply doesn't have a voltage with respect to ground? 1. Will this produce ozone? 2. Sounds like an ideal air filter. Tiny holes & electric charge = dust trap. 3. Does it tollerate humid damp environments? This technology needs testing in an average dusty living room or office. Curious if the 'intense electrical field' is of any concern in mobile electronics in a pants pocket or held next to an ear. Oh... not to sound negative with my previous comment, this device is a great start to a new way of cooling electronics. Very impressive. Any good for model aircraft? This appears to be a follow-up on an article back from 2004 from the "Relevant stories" column. It is very good to see they didn't give up and are finally ready with an actual device. I hope it will be less than another 4 years before we hear about this again though. I don't think you can reverse this. Yeah I doubt reversing to generate power would be feasible. Heres how reversing could be done: an insulating funnel compresses the wind into a smaller diameter high velocity stream. In the center of the plastic pipe at the end of the funnel you place an electrode generating plasma ie ions, and then downstream a metal surface partly blocking the way which would make another electrode. Now the stream of air would blow ions from generating electrode onto the metal plate which would result in some small current. The problem with this design is that generating plasma would most likely use up much more energy then you would get out of that current. Though I'm not very familiar with plasma generators so maybe theres some way to make it efficient enough. How cool is the ionized air? It won't work to cool something with hot air. Well at least it seems to be an alternative to water-cooling my PC. My HTPC is right by the sectional and ANY decrease in fan-noise is welcome. Wonder how long it'll take for them to show up on newegg?